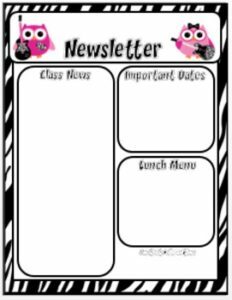 Are you looking for a quick easy newsletter template to send home to parents on a weekly, monthly or six weeks basis? These templates are easy to use, just open the Powerpoint document, choose the page layout you want to use, click in the text boxes and add your text. Some pages allow you to add your own titles or section boxes. Clip art and frames are not editable due to copyright restrictions. -Page 1 with Section Titles and Section Box Outlines. Click into the text boxes to type in your content. -Page 1 with only Section Box Outlines. Click into the text boxes to type in your titles and content. -Page 2 with Section Titles and Section Box Outlines. Click into the text boxes to type in your content. -Page 2 with only Section Box Outlines. Click into the text boxes to type in your titles and content. -Page 2 that is blank. Add your own section box Outlines and text boxes. Customize this page to look exactly like you want it. Please be sure to come back and leave feedback. If you like my work, follow me for new product information and updates. ← Why Back to School Anxiety is such a big deal, and what to prioritize to get through it!